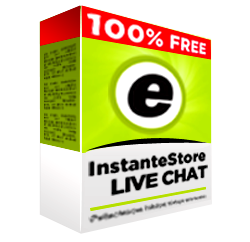 You can now provide live chat support to your customers for free… courtesy of InstanteStore. We’ve just launched our live chat software that lets you chat in real-time with your website customers for FREE. To get set up, all you need to do is go to https://www.instantestore.com/livechat_software.cfm, click to download the live chat software, create your account, and copy and paste the generated code to your store to start taking customer queries right away. It’ll take 3 minutes, tops. Try it out for yourself now.